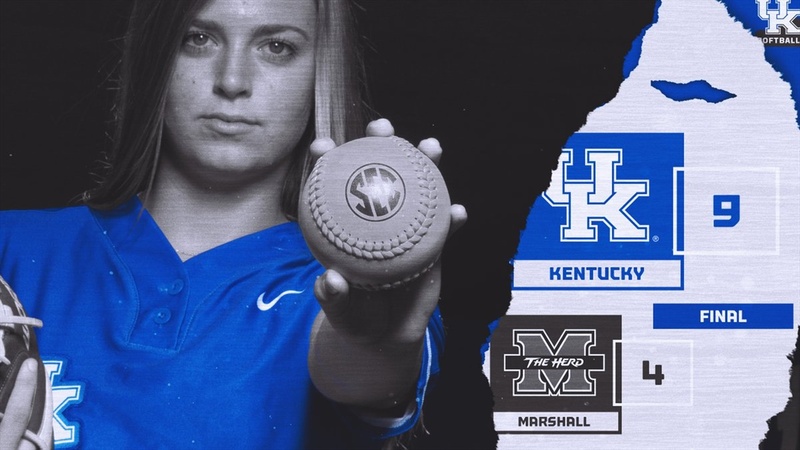 Kentucky traveled to Huntington, WV to take on Marshall University, Wednesday afternoon. With the help of Abbey Cheek, Kentucky got a 9-4 win over Marshall. Cheek pummeled her 48th career home run in the top of the first and tied Brittany Cervantes for the all-time Kentucky record. Kentucky has won 12 games in a row and has an overall record of 21-7 on the season. Kentucky gets on the board first by Kayla Kowalik walking and Abbey Cheek hitting her 48th-career home run to left field to score two, (UK 2, Marshall 0). Kentucky would score seven times in the third inning. Abbey Cheek came home on an Alex Marten double. Mallory Peyton was hit by a pitch to put two on before Katie Reed bunted for a single to load the bases. Grace Baalman then singled to left and knocked in a pair of runs before the Cats added yet another run on a fielding error by Marshall. To cap off the inning, Jenny schaper singled and brought home Bailey Vick, (UK 9, Marshall 0). Marshall would break through with a solo home run in the bottom of the third to get on the board, (UK 9, Marshall 1). The Heard would add three more runs before the end of the game to lose by five. The Cats return back to SEC play as they host Missouri for a three game series at John Cropp Stadium in Lexington this weekend. Game one is Friday night at 6 p.m. ET and all three games will be shown on SEC Network Plus, ESPN3 and the ESPN app.